Welcome to McQueen Community, Edmonton's smallest community, located in West Edmonton. It is named for the Rev. David George McQueen, who served 43 years as minister at Edmonton's First Presbyterian Church from 1887 to 1930. School zones are in effect around elementary schools throughout Edmonton. 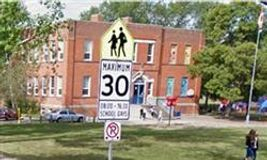 Motorists are required by law to slow down to 30 km/h between 8am and 4:30pm on school days where school zone signs are posted. The lower speed limit improves safety around elementary schools and protects our most vulnerable road users: young children. Please follow the posted speed limits. Click here for more info. Need a McQueen Community League Membership? ONLINE membership submission is now available! Use our Open Data interactive map to search for City of Edmonton construction on your streets. It is compatible with most browsers and mobile devices. Become a McQueen Community League Member Today! Free swimming at Grant MacEwan Centre for Sport & Wellness pool on Sundays from 2-5 p.m.